Please enter your text below. This 0.7 litre, straight sided tankard is the perfect gift to give to your employees on their retirement. 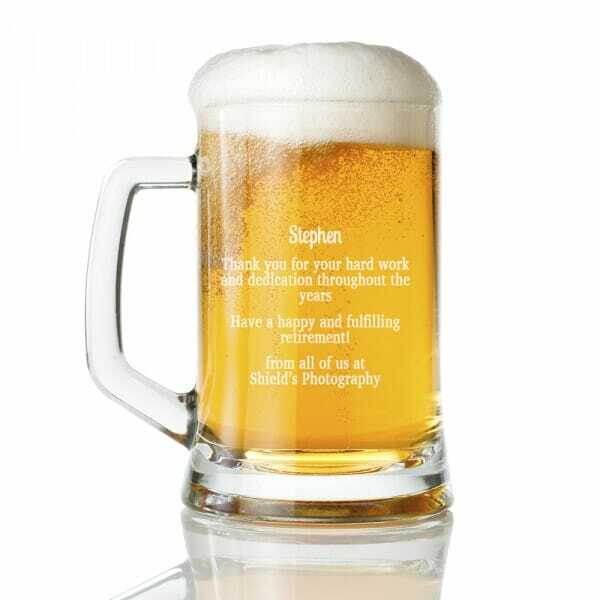 This tankard adds a nice personal touch and shows all your employees, not just the person who is retiring, your appreciation for their work. To create your personalised tankard, simply enter the details you want to see on the glass in the fields on the right and we will create the design for you. You can also upload graphics to be engraved on the tankard. The tankards will be expertly engraved with our specialist laser machines and is delivered in a blue presentation box. Customer evaluation for "Retirement Tankard"